Chapel Street is my forbidden apple. My dad certainly jokes that I keep the whole squirming place just alive. I can't help it. I'm drawn into just about every shop. I have a real shopping addiction and this has been so since the age of twenty. Shopping is my life. A lot of the time I certainly shop till I drop. I often feel like I'm going to pop the huge balloon or huge canister of goodies on offer to me. As I pass each shop, I feel I have to be arm wrestled or chained or blasted not to go in. On one occasion I was certainly given my marching orders not to keep going in, as I went for the umpteenth time in my tracksuit pants. I was told after having gone in three times in two days, pondering over a fake gold watch that I was 'getting pretty regular'. However at the other end of the spectrum, I can certainly feel the burning look of many shop assistants beckoning me to come in as I pass by. Yes, I know they are desperate in Chapel Street, with landlords charging exorbitant rent for all the shops. This means they have to hike up all their prices. I once paid hundreds of dollars for a bright orange horror when I was at my heaviest weight. It made me look like a huge pumpkin. On another occasion I bought a pale pink coat that left me looking worse than all the pink ladies in Grease. To top it all off I bought a skirt for over a hundred dollars that my mother said looked like a petticoat. I have certainly made many expensive mistakes in Chapel Street when the shop assistants have been aware and are on the take. This includes every fake piece of jewellery or designer clothing label that I can find. However my true label is that I am a shopaholic. The shopping addiction has been described by one psychiatrist as abnormal and connected to my OCD and schizophrenia. He has basically put it down to me not knowing the difference between a want and a need and having very poor judgement and impulse control. In the past my mother and my father have had to intervene to stop me letting loose like a dog down Chapel street. They have both rescued me from keeping totally unsuitable clothes by showing a letter to the shops by my psychiatrist, stating that I have an 'obsessional preoccupation' with spending money and please can the items be refunded. The authority of this letter made most of the shops willing to cooperate. However with the passage of time I now realise that I cannot afford to hang on to the security of this letter. I have to show complete responsibility for all my actions and suffer the consequences of skipping on meals due to buying that skimpy dress. As I go down Chapel Street, I feel like I am running a million miles an hour trying to look a million dollars. However I also feel it is my fate as I go down there loving every minute of it. In many ways I can feel myself cruising. Yet I have to think of myself as hitting rock bottom once I run out of money and then all the fun suddenly stops. One therapist described my money situation as having champagne taste on a beer income. I go way beyond my means and then feel terrible when I have to sponge off others for food and drinks and cannot spare a few dollars for those less fortunate. However I still love and adore the high life in Chapel Street. I feel so high as I go along there. Yet once I get low on money I want to lay low and go slowly like a tortoise or a horse with blinkers on down Chapel Street. I don't want to jump like a grasshopper into every shop. Even though it is hard for me to restrain myself I have to train myself to resist all Chapel Streets garden of delights. I have to think of a dark, hell-like prison that I'll experience and which keeps me banging my head against a brick wall every time I shop. I have to keep saying these things to myself and it sure becomes like torture that the only way of curing my shopping addiction is by not going into shops. If I do happen to stumble into a shop which is much more likely I have to get myself to stagger out as dignified as I can before I get my fill and break the till! Isabella Fels is a Melbourne poet and writer. She has been published in various publications including Positive Words, Mental Illness Voice, The Big Issue and The Record. 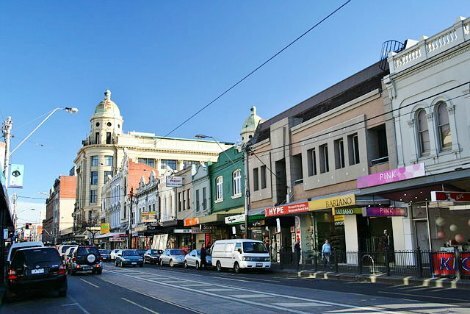 Image of Chapel Street, Prahran by Matt Connolley via Wikimedia Commons under Creative Commons licence. Its hard to define, but reading this is knowing that you are reading about courage. I have some understanding of your suffering, Isabella, but I hope you can rejoice in the good things in your life, your own sense of humour, your gift with words, your insight into your illness, the support of your parents and the wisdom of your psychiatrist who not only recognises symptoms, but has the skill to explain them to you. Congratulations on your achievements and what I call your heroism. Thank you Isabella for a beautiful piece of writing. Chapel Street is hard enough for those of us who don't share your illness. It is wonderful to see your sense of humour and we are all rooting for you. A beautiful and both funny and painful story. Very generous of you to share it.